In the April issue, we introduced you to the 5/3/1 method by showing you how to do it with two assistance exercises. This is a great template to follow, but there are two other effective options for building muscle mass-the bodybuilder and boring but big templates. Before we get into those, know that you do not have to limit yourself to improving on just the shoulder press, deadlift, bench press, and squat. 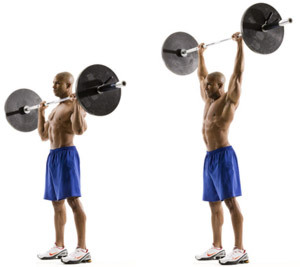 You can, and should, rotate your lifts from time to time. Just make sure you’re switching to similar movements that work the same basic muscle groups. For instance, you can apply the 5/3/1 method to these substitution lifts. Follow the set and rep guidelines for 5/3/1 on your first lift of the day, and then perform four or five assistance lifts with very high volume. Because the volume is a large increase over what we offered you in the magazine, do not take any of your sets to failure. Just go for a big “pump”. Sets: 4 Reps: 10 Rest: 60-90 sec. Sets: 4 Sets: 12 Rest: 60-90 sec. Sets: 4 Reps: 15 Rest: 60-90 sec. Sets: 4 Reps: 12 Rest: 60-90 sec. Sets: 4 Reps: 25 Rest: 60-90 sec. Sets: 4 Reps: 10-15 Rest: 60-90 sec. In this template, you’ll only do two assistance lifts, one of which will be a repetition of your main lift for the day, but using a moderate weight and very high volume. The other will either work a complementary group of muscles or your core. The lack of variety means it’s not the most exciting way to train, but it will build muscle and strength quickly. Sets: 5 Reps: 10 using 50%-60% of your max Rest: 60-90 sec. Sets: 5 Reps: As many as possible Rest: 60-90 sec. Sets: 5 Reps: 12 Rest: 60-90 sec. Sets: 5 Reps: 10-20 Rest: 60-90 sec. Sets: 5 Reps: 10 Rest: 60-90 sec.